﻿ Dental Editorial: Is Cosmetic Dentistry an Industry or an Art? You are here: Home / Dental Editorials / Is Cosmetic Dentistry an Industry or an Art? Is Cosmetic Dentistry an Industry or an Art? Are dentists losing control of cosmetics? Is it our own fault for being short-sighted? Last week’s graph is characteristic of consumer demand. 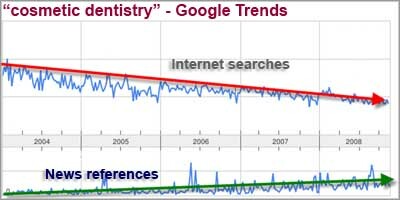 We have to remember that Cosmetic Dentistry has become an industry. Just count up the number of “Cosmetic Gurus” on the speaking circuit, the Cosmetic Institutes, and the number of Cosmetic Materials and Equipment suppliers. All of these groups have a major economic investment in beating the drum and growing the industry. Even more important are the tens of thousands of dentists who have invested their hard-earned time and money in this industry. Cosmetics allow dentists to express themselves as artists. “Art” is an emotion. And I believe that it is this artistic emotion that has driven the Cosmetic Dental Industry to this point. The real question, which we will explore next week, is centered on the “Demand” side of the equation. Is the market for cosmetic dentistry dying in face of the lack of consumer demand?